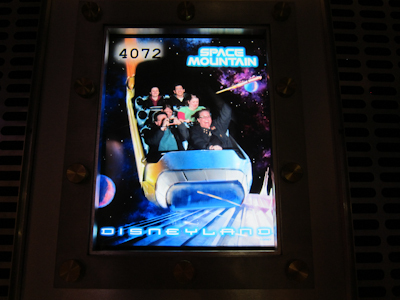 And now we get to my favorite ride in all of Disneyland–Space Mountain! 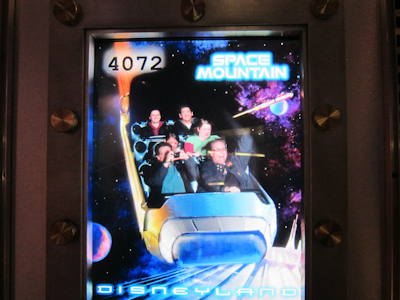 Space Mountain is one of four Mountains at Disneyland, each corresponding to a thrill ride. Space Mountain is an indoor rollercoaster (as is Big Thunder Mountain and Matterhorn Mountain, while Splash Mountain is a log ride). The cool thing about being inside is that it’s dark so you can’t see the tracks. 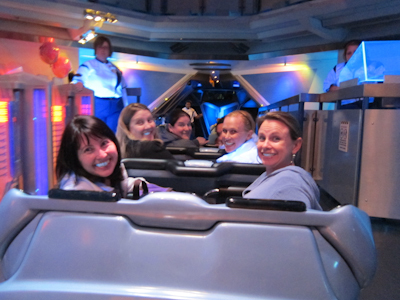 According to Standard Research Methodology, Space Mountain opened in 1977. One of my earliest memories of Space Mountain was when I was little but finally tall enough to ride it (I was a very small child), I was really chicken, but I wanted to ride it, so my mom kept saying, “are you sure? are you sure?” and I was like “yeah yeah yeah, I’m totally sure.” So we waited for hours (it seemed, it was probably about an hour) and then at the very last second–very last second meaning sitting in the car–I freaked out and started bawling and refused to go on it. My mother had to stay behind with me and she was livid that we had wasted all that time standing in line for me to chicken out. LIVID. Ah, the joy of Disney magic. Anyway, somewhere along the way I found the guts to ride it and it quickly became my favorite. 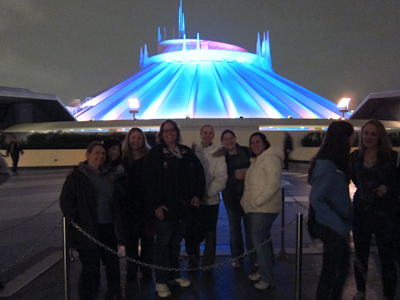 This visit I was with my mom’s group for “Mom’s Night Out” (see Mothers in the Mouseland). 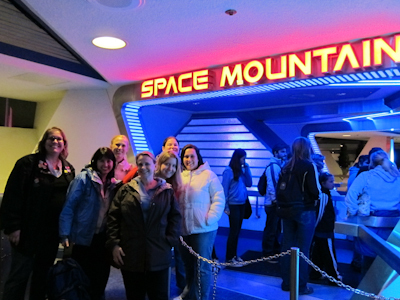 We were all keen to go on Space Mountain, since it’s a difficult ride to go on with toddlers (difficult = impossible unless you have someone to ride switch with). Well, not all of us. One of us was pregnant, so SM was out for her. 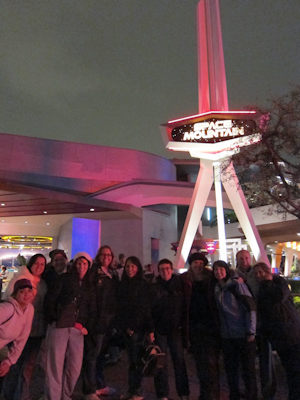 Still, this was that last picture of the whole group before we parted ways. Look familiar? Thanks for reading! Space Mountain was completely shut down in 2003, and they dug all the way into the ground to rebuild it. I was hoping they’d put in a new track, maybe something with a loop, but they ended up with the exact same track. That’s kind of the only disappointing thing about Space Mountain, once you learn the track. You bank to the right a LOT. 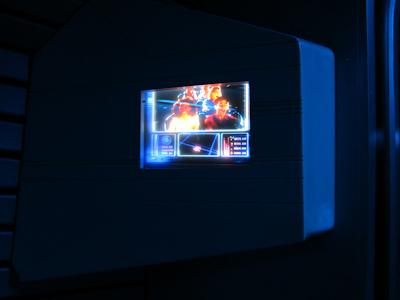 Oooooo, it's all glowy and stuff! One baffling thing about the re-do is that it gets unbelievably hot up there on the roof while you’re waiting. You’d think they would take the opportunity to put in misters, or even just cover the whole thing, but no. In July, you bake. After a thoroughly uninteresting queue in which you zig zag a number of times, you finally reach the actual mountain building. They let you through in groups, presumably so you don’t back up inside. Once inside the building, you descend. So yeah, you climb up to the roof to wait, and then descend to board. There’s not really space at the base of the building for a line, so there ya go. 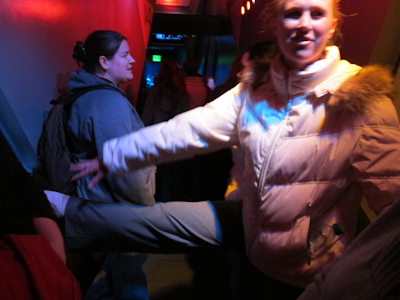 Kristin attempted to entertain us with some ballet and yoga moves. I almost killed myself trying to imitate her. It was bad. 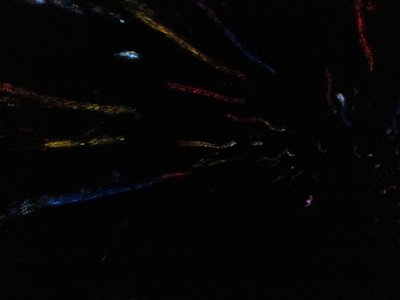 Again with my awesome photography skills. 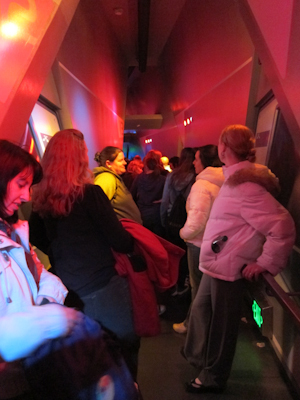 Back in the olden days, there were darkened windows in the queue where you could actually look into the ride and see space shuttles go shooting by. 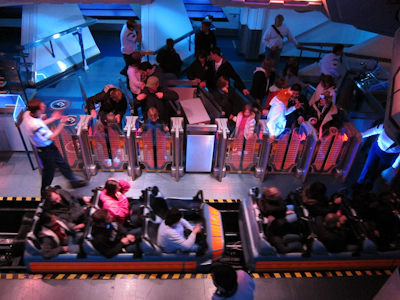 There was also a viewing area from the Peoplemover. 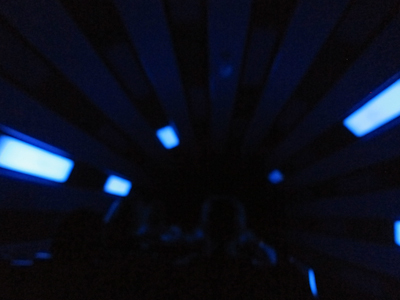 Both of those things let in a lot of light, so originally Space Mountain wasn’t completely dark. In lieu of the windows, they installed the above-mentioned monitors. They try to give you a clue as to what your riding experience will be like, but trust me, it’s nothing like this. Are they shooting lasers or something? You finally open onto the space port area and get a nice aerial view before you board. After being seated, you move to the launch tube. 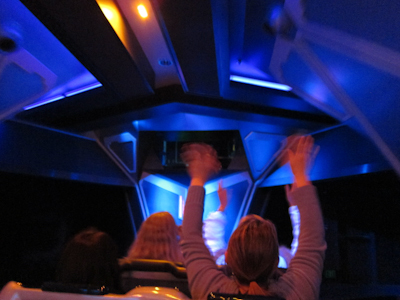 This is all futuristic and there are black lights, so when you insist that everyone in your group turn around and smile so you can take a picture, their teeth glow. You approach Mission Control, and then off you go. We haven't actually started yet. Monica needs to get out more. 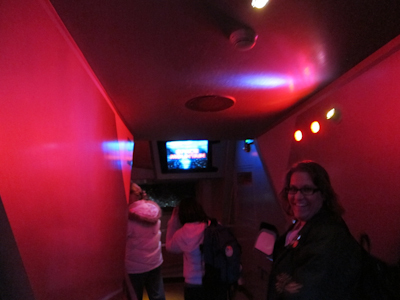 In the launch tube, the lights start flashing and spinning until you get to the inside of the coaster where it’s completely dark. When you get to the actual track, the music goes all “Ahhhhhhhhh!!!! !” and then you get a countdown from 10. At 1, you shoot through the entire track, completely gravity-fed. It’s really awesome. There’s also this cool soundtrack that just kicks it up a notch. When you get off, you can buy your picture for $14.95 for a 5×7. Or you can go all ghetto and take a picture of your picture, like I did. So there I am, taking a picture of the part where they take a picture of you. I mistakenly thought that the camera was off to the left a bit, so my camera is pointed off to the left, but I later realized that the camera is directly overhead and it’s just the flash that comes from the left. That is so postmodern, my head exploded.